After four Olympic swimmers reported an armed robbery on Sunday, Aug. 14, something didn't seem right to Brazilian authorities. U.S. swimmers Ryan Lochte and James Feigen claimed they, along with Gunnar Bentz and Jack Conger, were robbed at gunpoint by robbers posing as police, who took their wallets and their money. However, their story didn't quite hold, and as they were heading back to the United States on Wednesday, Brazilian authorities removed Bentz and Conger from their flight. Feigen is also being held in Rio. Perhaps one of the best responses to the whole incident is this tweet mocking Lochte and Donald Trump at the same time. Ian Millhiser, the justice editor at ThinkProgress wrote: "I'm not saying we shouldn't ever allow swimmers in the United States. We just need a ban until we figure out what the hell is going on." The message clearly pokes fun at the GOP nominee's previous suggestion to ban Muslims from entering the country. Back in December, in response to the shooting in San Bernardino, California, and in the midst of discussions regarding Syrian refugees entering the country, Trump proposed a "total and complete shutdown of Muslims entering the United States until our country’s representatives can figure out what is going on." 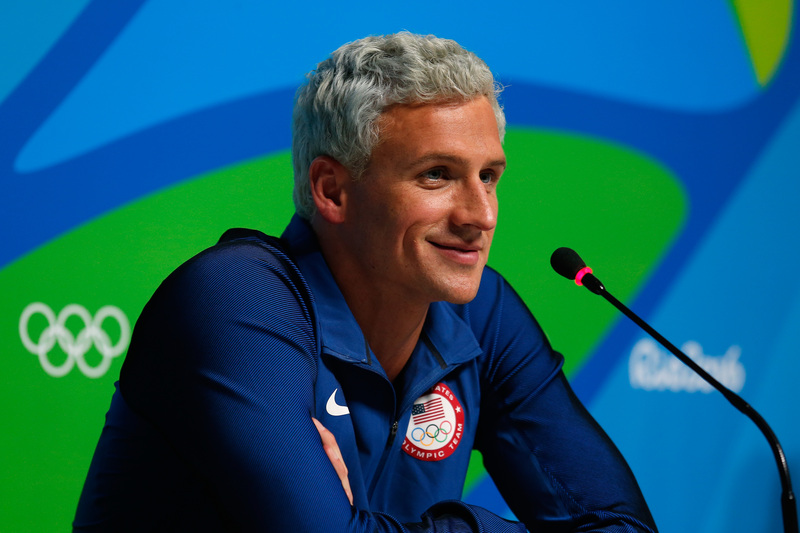 As of Thursday morning, the Associated Press reported that the swimmers' allegations were flat out false. The AP noted in a tweet that the "swimmers were in rowdy gas station confrontation," which Brazilian authorities confirmed on Thursday afternoon during a press conference in Rio. O Globo, a daily newspaper, spoke with the owner of the gas station who reportedly said, "They stopped next to the gas station, and urinated outside right next to the gas station. We even have images of one of the athlete's butts, as he is pulling up his pants." Brazilian police declared that the U.S. swimmers were not victims of robbery, that they vandalized the restroom, and then tried to leave before the police arrived, according to BuzzFeed News. However, Lochte's attorney Jeff Ostrow maintains his client's story and told CNN, "He's the victim. He didn't commit a crime. Same with the other guys. The story needs to be about 20-something-year-old kids pulled off an airplane, they're being detained to testify to police? C'mon." It seems what happened was a matter of American athletes drunkenly abusing their privilege in the Olympic host city, first by reportedly vandalizing the gas station, and second by trying to cover it up with allegations of an armed robbery that would obviously associate a negative image with Rio. But Millhiser's hilarious point still stands: We just really need to keep these swimmers out of the United States until we figure out exactly what is going on.